Gordon Fee, Pauline Christology: An Exegetical-Theological Study (Peabody, Mass: Hendrickson, 2007). Read the other parts of this review. 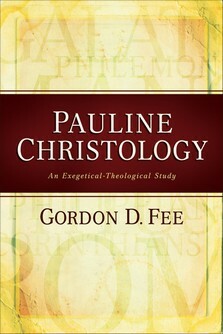 This will be the first post in an ongoing review and summary of Gordon Fee’s Pauline Christology. This book is an attempt to see Paul’s understanding of the person of Christ, in distinction to His work. I have decided to extend this review for two reasons: objectively this is a monumental work and its subject matter is central to our faith; subjectively this book has been very impactful to my personal devotion to and understanding of the person of Christ. Right off the bat in the introduction Fee notes one of the difficulties found in such a study, “a distinction between Christology and soteriolgy is not one that Paul himself makes” (1). Additional problems are found in the fact that in all of Paul’s writing, only one passage could be considered intentionally Christological (Col 1:15-17), and therefore most of our understandings of Paul’s Christology come from seeing the presuppositions about Christ that lie behind his argumentation. Words like Son, Christ, and Lord have a shared meaning to Paul and his readers. Next, he notes the theological dimension of Paul’s Christology, the fact that as a Jew Paul is a strict monotheist, and yet he speaks of Christ in ways that more than imply his belief of Christ being included in the divine identity. Fee then gives a summary on Pauline Christology in the twentieth century, highlighting the more prominent works. The three major Christological texts (1 Cor 8:6; Col 1:13-17; Phil 2:6-11) are then briefly discussed, drawing out the primary Christological emphases that are found in Paul. For example, in 1 Corinthians 8:6 Fee makes 5 conclusions about Paul’s Christology: Jesus is Son of God and Lord; he consistently (argued by Fee) utilizes ‘Lord/κύριος’ for Christ and ‘God/θεός’ for the Father; he has applied Lord/κύριος from the Septuagint’s translation of Yahweh to Christ, identifying Him as the Yahweh/Lord many of these OT texts; he assumes that Christ is pre-existent and the agent of creation; finally, there is no ‘Wisdom Christology’ found herein, despite opposing claims. Fee argues that Paul’s readers used the Septuagint and would have understood that Paul’s references to Christ as ‘Lord’ carried the full Septuagint meaning of ‘Yahweh’. The book is then broken into two parts: analysis and synthesis. In the former, Fee examines the data of each letter of Paul in ‘chronological order’ (as best as we know) in context. Each Christologically relevant text is exegeted and discussed, with some more controversial or relevant texts being given more space. The content of the analysis is very clear and interesting to read, and is also useful for reference. I will review the synthesis chapters individually to allow space for better summarizing Fee’s conclusions. Be on the lookout for these summaries in the coming weeks.